In a bombshell CBS 60 minutes news program Irving Kirsch, a Harvard University expert in placebo effects, has stated categorically that Prozac-type antidepressants have no effect. The serotonin-based medicines taken by 40 million patients generating a 12 billion dollar business in USA alone have the same effect as the harmless sugar pill. Although most patients felt their depression had been alleviated their body chemistry showed no change. To get the other side of the story the news program broadcast on February 19 2012 interviewed a university psychiatrist working closely with the pharmaceuticals industry who said in reply that 14% of patients are actually helped by taking the meds, implying that 86% of patients were taking the antidepressants needlessly. Mr Kirsch went on to say that the allopathic medical industry actually used placebo operations where an incision was made in a patient and then sewn up again just to make the patient believe that the painful joint etc had been rectified and he or she would now be fine and in fact the patient actually reportedly felt a full recovery although no real operation had been made. The patients who were taking the antidepressants all felt well although their brain chemistry was unaffected by the serotonin replacement pills. They were convincing themselves that they would be well taking the pink pill – and so they did. In fact the serotonin from the pills goes out into their urine and ends up in the rivers, lakes and sea affecting the fish instead and perhaps other human beings if they drink tap water originating from inland waterways. In Britain the National Health Service recommended doctors over ten years ago not to use such antidepressants because the research they did into the lack of effect of this kind of medicine. 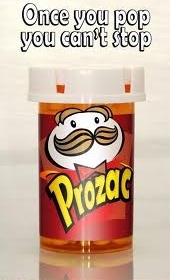 It may however still be used with patients suffering from more serious depression. In effect the NHS said these widely prescribed pills were not effective and therefore money literally down the drain. The good news for those of us suffering from slight or medium depression is that regular exercise has the benefit of lifting depression in many cases and with no side effects other than a longer and more enjoyable life. So far the major pharmaceutical companies producing these meds have not made any statement on this finding which might drastically affect their company’s bottom line.